Welcome to the UW-Madison community. Your first step to becoming a Badger is attending SOAR! Get started by reading the below checklist. Before coming to campus, use this website as your guide to prepare for your SOAR session. The checklist includes links to a variety of campus offices and resources to help you access the most up-to-date information. If you have additional questions, you can also always contact the SOAR office by email at soar@studentlife.wisc.edu or by phone at (608) 262-4707. We can’t wait to see you on campus! The Office of Admissions provides lots of information for new freshmen, transfer, and international students who are transitioning to UW-Madison. Please complete the correct checklist for your admit type before continuing with the SOAR registration process. You will need to complete placement testing before attending your SOAR session; placement testing is the way advisors learn more about your skills and help correctly advise you about your first-semester courses. Freshmen are required to take English (or English as a Second Language, ESLAT) and math placement tests, regardless of previous coursework. Testing in a world language is also highly encouraged. Transfer students are informed which test(s) they are required to take via email from the Office of Admissions. Information about which test(s) you need to take is also available at the bottom of your Transfer Credit Evaluation, located in your Student Center. More information about placement testing can be found here. Review the content listed on the SOAR Program Overview page. Students should determine which advising group they will advise with at SOAR. Review the information provided by the Office of Undergraduate Advising at advising.wisc.edu. The SOAR program strives to ensure all participants can fully participate in the program, if students or guests need accommodations for the SOAR program, please follow the links below. Freshmen SOAR sessions span two days, and overnight housing accommodations were not automatically included in your SOAR registration process. We recommend staying on campus to experience all residence hall living has to offer. Book your stay online at www.housing.wisc.edu/conferences/soar/reservation/. Both parents and students have the opportunity to stay on campus. If staying in housing is not the best fit for your family, there are many local places to stay in the Madison community. For a list on-campus hotels offering competitive rates and private hotels offering discounts to SOAR participants visit soar.wisc.edu/hotels. There are no overnight housing accommodations available during our transfer program, a list near campus hotels offering competitive rates and private hotels offering discounts to SOAR participants visit soar.wisc.edu/hotels. There are no overnight housing accommodations available during our International/Late August SOAR. Students can move-in early to their residence hall if they are participating and can also consider taking advantage of transitional housing if needed (www.housing.wisc.edu/fall-transition-housing/). Family members on campus for move-in and/or the SOAR program are encouraged to look at the list of local hotels offering discounts to UW famlies. Complete the Preparing for SOAR module in MyUW. This must be completed prior to arriving at SOAR. Pay any outstanding SOAR fees. Learn more about academic advising on campus and about how advising will work at SOAR by visiting the Office of Undergraduate Advising’s website. Review this information to prepare for your SOAR experience. 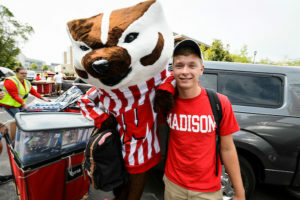 SOAR gives you a closer look at what life is like for a UW–Madison student. Come to Madison prepared, and discover the exciting resources waiting for you. Please take some time to fill out the SOAR Program Evaluation after you complete your SOAR session. Looking to get a jump start on your Wisconsin Experience? In addition to SOAR, check out these other summer opportunities for new students!